리소스팩 시스템은 마인크래프트 플레이어들로 하여금 새로운 경험을 선사합니다. 리소스팩은 플레이어로 하여금 텍스쳐를 변경할수 있게 해주고, 모델들, 음악, 소리, 언어 파일, 크레딧, 스플레쉬, 그리고 폰트를 아무런 코딩 없이 변경할수 있게 해줍니다. 따라서 코딩을 모르셔도 얼마든지 만들 수 있습니다. 이 부분의 본문은 리소스 팩 만들기입니다. 리소스 팩을 만드려면 마인크래프트의 구성 요소에 대한 이해를 필요로 합니다. 이건 pack.mcmeta 와 pack.png 를 필요로 합니다. "assest" 폴더에, 언어 파일과 애니메이션 속성을 추가하는 방법, 텍스쳐와 폰트가 있습니다. 위의 링크는 당신이 리소스팩을 이해하고 만드는데 크나큰 도움이 될 것입니다. 하지만 만드는데 시간이 꽤 걸립니다. 폴더 구조는 다소 복잡할수 있지만, 여러번 보다 보면 이해가 될것입니다. 폴더 구조는 아래와 같습니다. en_US.lang - [언어 코드]_[국가 코드].lang - 텍스트 기반 언어 파일. credits.txt – UTF-8을 사용해 번역합니다. end.txt – 끝난 시. UTF-8 을 사용해 번역을 씁니다. splashes.txt – 스플레쉬 텍스트 입니다. 역시 UTF-8을 사용합니다. sounds - 소리들을 바꿀수있게 해줍니다. carrots_stage_3.png - 심어진 당근, 마지막 단계! destroy_stage_0.png - 만약 블록이 파괴됬을때, "cracking" 의 첫번째 스테이지 애니메이션. destroy_stage_9.png - 블록이 파괴됬을때, "cracking" 의 마지막 스테이지 애니메이션. grass_side_snowed.png - Used when snow is placed on top of grass, podzol, and mycelium. 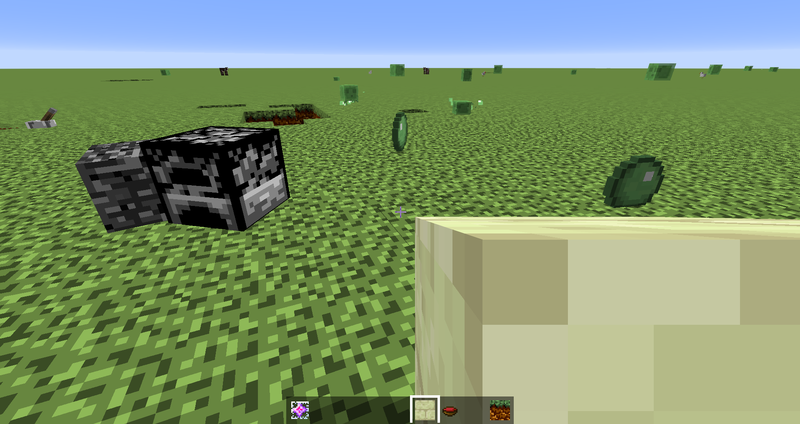 creeper_armor.png - The overlay texture applied to a creeper when it becomes a charged creeper. enchanting_table_book.png - The texture of the book that hovers above the enchanting table. steve.png - The default player texture. wolf_collar.png - Grayscale, can be colored in-game with dyes. Default color is red. ascii.png – Glyphs for non-unicode languages. Despite its name, this file contains non-ascii characters. Each glyphs need to be squared, and transparent pixels should be black and have an alpha channel value of 0.
unicode_page_00.png - Custom unicode are not supported at the moment. achievement_icons.png - Currently unused, the achievement "icons" are taken from other block and item textures. generic_54.png - The large chest GUI. inventory.png - Also contains the textures used for status effects. options_background.png - Currently has the dirt texture applied, but other textures can be used. bow_pulling_0.png - The first frame for the bow-drawing animation. bow_pulling_2.png - The last frame for the bow-drawing animation. clock.png - The clock animation strip. It follows the same format as other animated textures, but only uses its different frames for the time of day. compass.png - The compass animation strip. It follows the same format as other animated textures, but only uses its different frames when showing the direction of the player from his/her spawn point. dye_powder_black.png - The texture used for the ink sac. dye_powder_blue.png - The texture used for the lapis lazuli shard. dye_powder_brown.png - The texture used for cocoa beans. dye_powder_silver.png - The texture used for light gray dye. dye_powder_white.png - The texture used for bone meal. fish_cod_cooked.png - This is the texture for the item "cooked fish". As of 1.7, "fish" is referred to as "cod" in the code. fish_cod_raw.png - This is the texture for the item "raw fish". As of 1.7, "fish" is referred to as "cod" in the code. leather_boots.png - Grayscale, is colored by dyes in-game. By default, it is dark brown. leather_chestplate.png - Grayscale, is colored by dyes in-game. By default, it is dark brown. leather_helmet.png - Grayscale, is colored by dyes in-game. By default, it is dark brown. leather_leggings.png - Grayscale, is colored by dyes in-game. By default, it is dark brown. ruby.png - Not used in game. 텍스쳐 팩을 삭제하고 리소스 팩 추가 Minecraft Texture Ender 1.5 텍스쳐팩을 리소스팩으로 옮기는게 가능하다. HD폰트가 사용됬을때 폰트가 왜곡되는 버그 수정. sound 폴더가 sounds폴더로 이름이 바뀜. 한번에 여러 리소스 팩을 적용할수 있는 기능추가. 모장 로고를 바꿀수있는 기능 삭제. 리소스 팩은 이제 지도와 함께 번들로 제공될수 있다. 모델 형식은 이제 사용자 정의 항목 모델을 지원한다. 오래된 디스플레이 태그가있는 리소스 팩을 사용하면 모델이 비정상적으로 업 스케일링 된 것처럼 보이고 휘두르는 블록이 2D 텍스처로 교체 된 인벤토리의 블록과 함께 손에 회전되지 않습니다. 이는 모델에 표시 태그가 없을 때 발생하는 상황과 유사합니다. 예를 보려면 여기를 참조하십시오. 모든 파일의 소문자 변경 사항으로 인해 리소스팩 버전 번호가 3 으로 변경되었다. 이제 다른 리소스 팩과 마찬가지로 기본 리소스 팩을 위아래로 이동할 수 있다. "The Flattening"으로 인해 형식 번호가 4 로 변경되었다. "Texture Update"에서 새로운 텍스쳐로 교체되어 "Programmer Art - Minecraft의 고전적인 모습"을 리소스 팩 메뉴에 추가했습니다. 이 문서는 2019년 3월 29일 (금) 11:52에 마지막으로 편집되었습니다.